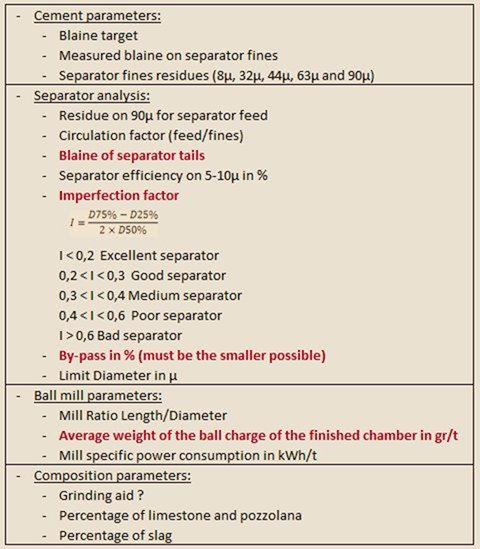 - Dynamic separators are classified in three categories (*), the first, second and third generation. 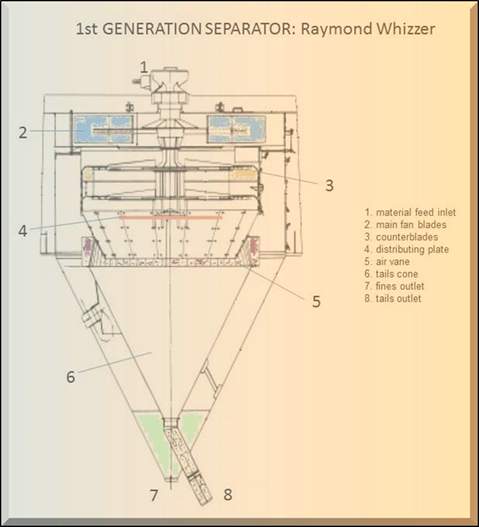 - In first generation separators, the air flow is generated by a fan within the body of the classifier. 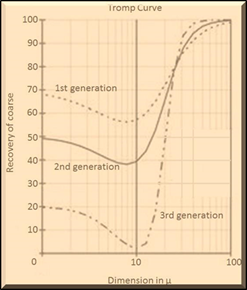 - In second generation, the air flow is generated by an external fan and there are cyclones. - And finally, the third generation has a rotating cage which replace the counterblades. 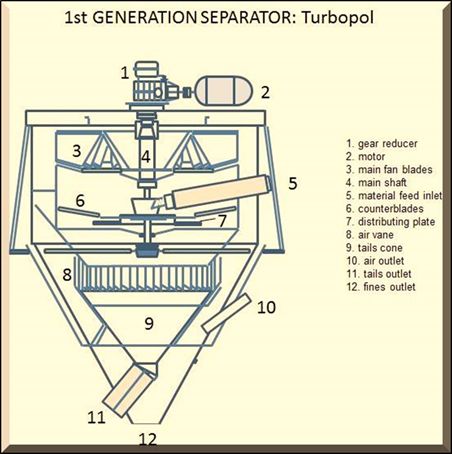 - Also called: Turbo separators or conventional separators. - The material to be classified is dispersed in the area where the separation is created by a distribution plate. 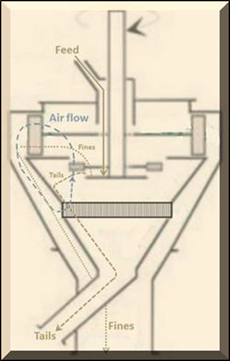 - The air flow required for the separation is produced by a fan located inside the separator itself. - The separator material feed is carried out mechanically by means of suitable continuous conveyors. for the distribution plate and the conterblades). - These separators are used for both raw material and cement. increasing the amount of fines coming with the tails. 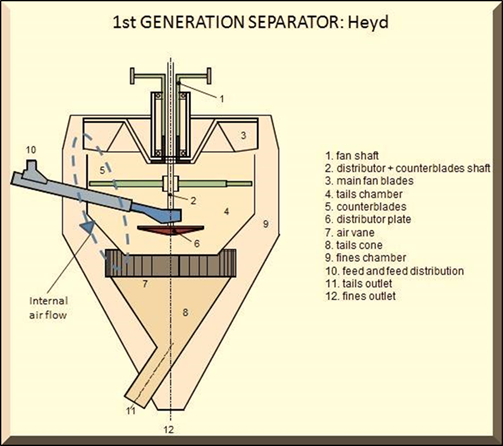 - The main fan produces a stream of air circulating within the separator. 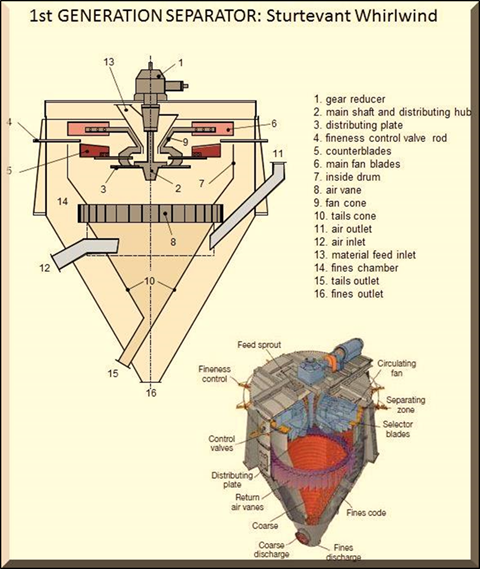 - The fan blades pull air from inside the inner cone and push it into the outer cone. - The material is generally fed on the top of the separator (in some cases, it is laterally). - Radial slats welded on the distribution plate prevent the displacement of the material which must be separated. - The air with dispersed particles flows up and passes the rotating counterblades. is proportional to the mass (volume) of the particle. area has a second chance to pick up any fines in the rejects. conveying air and collected in the outer cone. - The air with some amount of fine material is going back to the separating zone through the air vanes. - Separators can also have some air inlet and outlet for cooling or drying purposes. - Control valves: Adjustment of the control valves modifies the opening area for the air to go in the main fan area. in the main area will be reduced and the fineness will increase (for example Schmidt). the fineness increases (for example Heyd). - To increase the main fan speed. - To increase the distribution plate diameter. - To decrease the distance between the distribution plate and the counterblades. 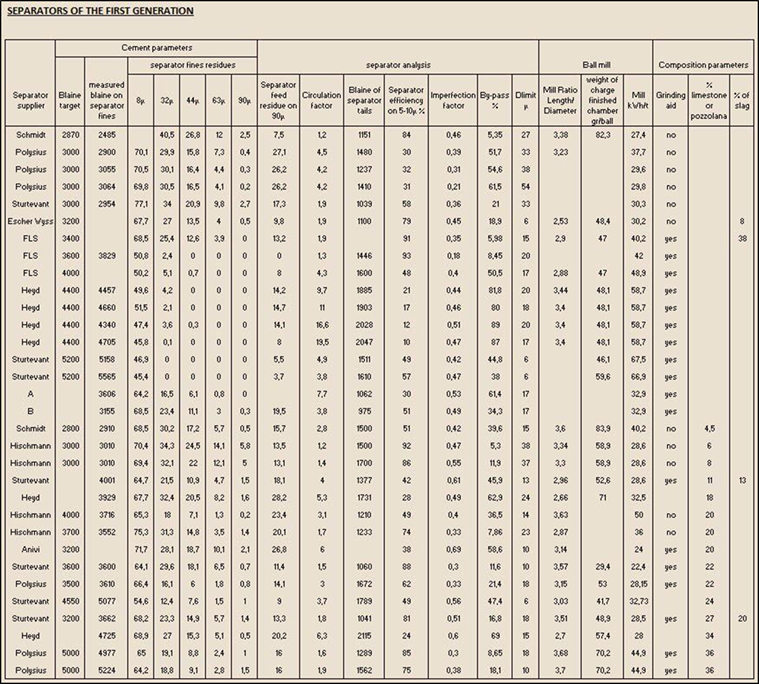 - The data sheet allows to have a good idea of the first generation separators efficiency.